Howling In The Summer 5 апреля 2015 г. The Summer Heat Haze 12 апреля 2015 г. The Kings of Summer 19 апреля 2015 г. The Fall Tournament Begins! 26 апреля 2015 г. The Cold Rain 3 мая 2015 г. Out of Order 10 мая 2015 г. Where I Am 17 мая 2015 г. Scenario 24 мая 2015 г. My Path 31 мая 2015 г. Did You Just Pitch... 7 июня 2015 г. The Underdog Story 14 июня 2015 г.
Self-Destruction 21 июня 2015 г.
Fissure 28 июня 2015 г. On My Shoulders 5 июля 2015 г. Persistent and Diligent 12 июля 2015 г. Chain Reaction 19 июля 2015 г. Shut Him Down!! 26 июля 2015 г. This Guy's Pretty Good 2 августа 2015 г. An Uncompromising Challenge 9 августа 2015 г. With Heads Held High 16 августа 2015 г.
Whispers of the Devil? 23 августа 2015 г.
Winging It 30 августа 2015 г. School Academic Level 6 сентября 2015 г. Individual Minds 13 сентября 2015 г. Zeal 20 сентября 2015 г. The Conceited Underclassman 27 сентября 2015 г. Step By Step 4 октября 2015 г. The Resilient Second-String 11 октября 2015 г.
Demon Child 18 октября 2015 г. The Kings' Roar 25 октября 2015 г. The Courage He Gave Me 1 ноября 2015 г. The Resolve for Responsibility 8 ноября 2015 г. The Ace's Instinct 15 ноября 2015 г. Innocent 22 ноября 2015 г. The World Beyond 29 ноября 2015 г.
Rematch 6 декабря 2015 г. Priorities 13 декабря 2015 г. One Pitch 20 декабря 2015 г. Meeting Expectations 3 января 2016 г. 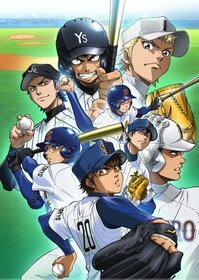 Play Ball 10 января 2016 г. The Lead-off Man 17 января 2016 г.
Fastball, Featuring Todoroki 24 января 2016 г. To This Side 31 января 2016 г. The Best Fastball 7 февраля 2016 г. The Field 14 февраля 2016 г. The Decision 21 февраля 2016 г. Partnership 28 февраля 2016 г. Party Boys 6 марта 2016 г. Just You Wait! 13 марта 2016 г. Last Inning 20 марта 2016 г. Seek Diamonds 27 марта 2016 г.